Thirty-two tertiary schools in the National Capital District and other centres around the country received K5 million in school fee subsidies from the NCD Commission. 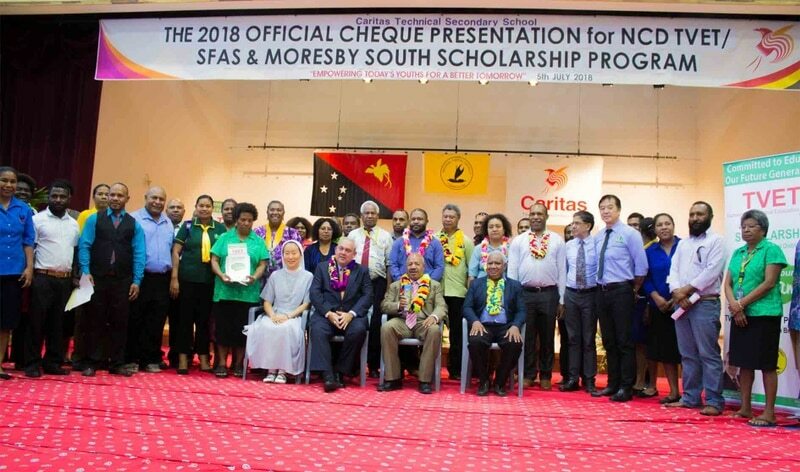 Speaking at the cheque presentation in Caritas Girls Secondary School in Port Moresby, NCD Governor Powes Parkop said since its inception in 2008, NCD TVET and school-fee assistance program has relieved many disadvantaged guardians, parents and their children in tertiary institutions. Mr Parkop said more than K40 million has been invested in the program, benefitting over 35,000 students since. He added that today some 1001 students were the proud recipient of subsidy. The program only complemented with the National Government’s Tuition Fee Free policy, he said. Those schools include the University of Papua New Guinea’s open college, main and Taurama campuses, Divine Word University, Pacific Adventist University, the University of Goroka, the University of Natural Science and Environment, University of Technology and others. Governor Parkop used the occasion to flag his major policy platform in his third term in office, citing upgrading of settlement to suburb, modernisation of Motu-Koitabuan villages, improvement of suburbs, eradication of violence and improvement of health and education. According to him, the scheme is part of his holistic strategy in making the city clean, safe, peaceful, active and liveable. He emphasised that the city will not be transformed into the best in the Pacific and the region as envisaged unless the outcomes of the policy’s aspirations are not materialised in partnership. Governor Parkop also emphasised that no one should be left behind or idle as far as education is concerned, echoing the United Nations Sustainable Development goals. Governor Parkop urged the students to partner with him and the City Hall to make this dream into reality. He further said the commission entered into a partnership with the World Bank to fund the Urban Youth Employment program at the tune of K30 million in the last three years. This program is also tailored towards achieving the same outcome, he said. He announced that the program, which has been hailed as a success in addressing many cross-cutting issues in the city, will be replicated in other main centres with funds sourced from the Australian government. 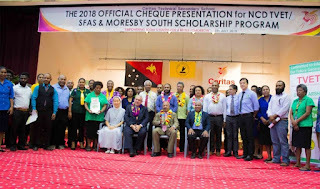 Apart from this, Minister for Lands and Physical Planning Justin TKatchenko also did his cheque presentation to schools in his district under Moresby South scholarship program.